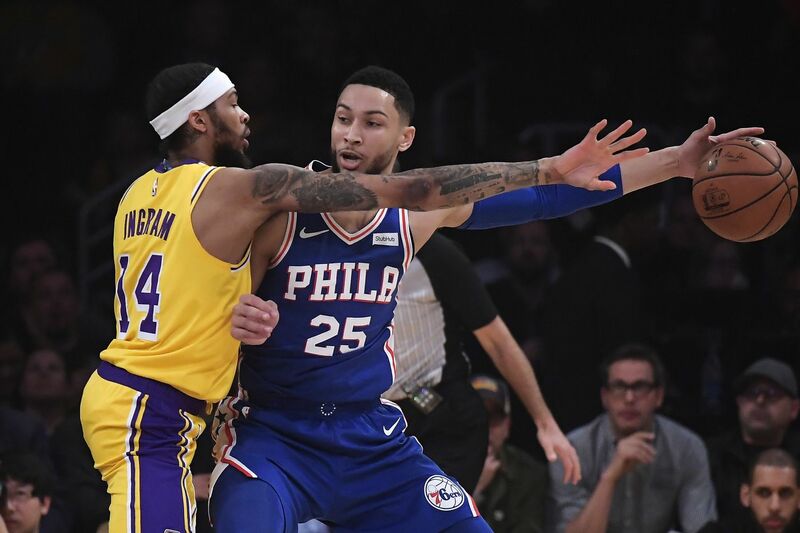 Los Angeles Lakers forward Brandon Ingram finds he can't take the ball away from Ben Simmons during the first half at the Staples Center. LOS ANGELES — The 76ers are in forward-thinking mode. Never mind that Tuesday night’s matchup against the Los Angeles Lakers was in the midst of their key four-game West Coast trip. Coach Brett Brown tried certain players at different positions in the Sixers’ 121-105 victory at the Staples Center. Jimmy Butler, a four-time All-Star swingman, saw some action at point guard. Power forward Wilson Chandler continued to get some run at small forward. Point guard Ben Simmons was moved to power forward during stretches. Reserve post player Mike Muscala played center and power forward. And Corey Brewer, another reserve, saw action at small forward and shooting guard. Joel Embiid finished with team highs of 28 points, 11 rebounds and 6 assists on a night when he had fourth-quarter scare. The center, who has been nursing a bad back, appeared to tweak it after missing a dunk early in the fourth quarter. The two-time All-Star center grabbed his lower back after awkwardly falling to the ground with 9 minutes, 43 seconds remaining following the miss. He was in pain and bent over after a break in action. Following a timeout, he briefly went to the locker room to get his back stretched out before returning to the bench. He looked fine and returned to the game later. Butler had 20 points, 6 assists and 5 rebounds, while Simmons added 19 points, 8 rebounds and 6 assists. Muscala added 17 points and seven rebounds. The Sixers led by as many as 24 points in a game they never trailed. Brandon Ingram paced the Lakers (26-25) with 36 points. Part of the reason for the position musical chairs had to do circumstances derived from lack of depth. Some of it was looking ahead to the postseason. Brown hoped to learn more about team. But Brown said most importantly, he did it to put the team in position to win games. Butler saw action at point guard because the Sixers will probably play him there some in the playoffs. The San Antonio Spurs did that with shooting guard Manu Ginobili during Brown’s time there as an assistant coach. He also moved Butler to point guard as a way to create more playing time for Brewer. The coach believes the 12-year veteran, who’s on a second 10-day deal, needs to play. “I think he’s earned the right to play minutes,” Brown said. Minutes for Brewer would be hard to get now that Butler is back after missing the past three games with a sprained right wrist, especially with Chandler seeing time at small forward. The Sixers realize there wouldn’t be enough minutes for Brewer if they played Chandler at the small forward combined with Butler. But on Tuesday, they had a lineup with all three on the floor together. They also had one lineup with Butler at point guard, JJ Redick (13 points) at shooting guard, Chandler at small forward, Muscala at power forward and Embiid at center. Before the game, it was announced that Simmons will play in the Rising Stars Challenge that will kick off NBA All-Star Weekend at the Spectrum Center in Charlotte, N.C. He is among the headliners for the Feb. 15 game for first- and second-year NBA players that pits the United States against an international squad. Simmons (Australia) will play for the World Team for the second straight year. Last season, the 2018 rookie of the year was joined by Joel Embiid (Cameroon) and former teammate Dario Saric (Croatia). There’s also a chance Simmons will be named an Eastern Conference reserve for the Feb. 17 All-Star Game. The reserves will be announced at 7 p.m. Thursday on TNT.